When the state isn't exporting weird headlines or conducting horrendously-flawed elections, residents spend much of the year looking for ways to keep cool. 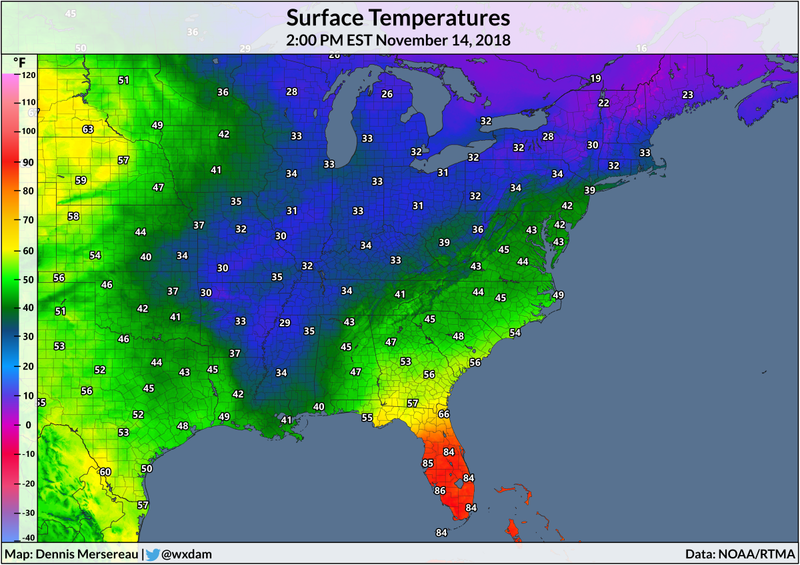 It's no surprise that it stays toasty pretty late into the year in Florida. The state is a huge attraction during the winter months because its enduring warmth seems unshakable outside of the biggest, meanest storms that envelop the eastern half of the country. The heat of late really has been unshakable. Not only has it been unusually warm so far this fall even by Florida standards, but the months-long extension of summer has approached record territory across the peninsular portion of the state. The period between September 1 and November 14 saw the warmest average daily temperature ever recorded at Miami International Airport. The average of all the daily average temperatures—that is, the high and low temperature averaged together each day, and all those averages then averaged together for the entire 76-day period—came in at 81.8°F, which is the warmest recorded during climatological fall since records at the airport began in 1937. You can see that daily highs have been above-average, but they only deviated from normal by a degree or two each day. The difference is in the lows. Most days saw a low temperature dramatically higher than what you'd expect to see for this time of the year. 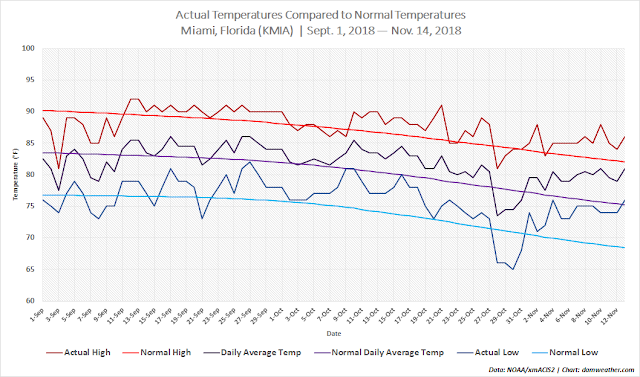 Except for the a couple of days at the end of October, the low temperature in Miami has remained in the mid- to upper-70s almost every day since the end of summer. Hot and humid days fading into warm and humid nights provides residents no respite from the heat. Warming nighttime temperatures is a noticeable trend across much of the United States. The increase in the number of warm nights is one of the concerning effects of climate change.